Our Jackson was a talented, passionate young man who also faced challenges. This website was created by Jackson in December of 2016 to build a portfolio of his talents in preparation for graduating and going into the workforce. We have added to Jackson’s site to share his story. In addition you will see many of his talents with his drawings, paintings and architecture models. Jackson was introduced to painting at a young age with a few summer classes from a local teacher and artist. He did not pick up painting again until his senior year in high school. He painted for a few summers during his first years at NDSU. Upon his acceptance in to the Architecture program, he began drawing and constructing models. Jackson liked to work out whether it was lifting weights or running. During college he ran full and half marathons and the summer of 2016, he completed a Tough Mudder. He also enjoyed biking, both pedal and motorcycle. A few years ago for a family birthday in Minneapolis, Jackson asked if he could meet us there for the celebration. He said on that Saturday, he was biking from St. Cloud. Pedal biking. He GPS’d the back roads and took pictures of city population signs along the way. He called us when he arrived in downtown Minneapolis to tell us he was going to be late since he couldn’t find the population sign for Minneapolis. Jackson started his architecture path at a very young age beginning with building items with Legos, K-Nex and erector sets. He also started using home builder software on our home computer as a fifth grader. He was dedicated to the Architecture program at NDSU and wanted his work to be the best so he could add to his portfolio for the future. This website was created by Jackson to showcase his architecture work. Jackson's experience working as an intern at HMA in St. Cloud confirmed for him that he had discovered a career that would allow him to share his talents and gifts with the world. We want to thank HMA for that opportunity. Jackson struggled with mental health related issues for 14 years. The challenge in our society is that mental health is not accepted like other medical conditions. My wife, Reyne, and I have been with Jackson on the journey of getting him help these past 14 years, navigating multiple setbacks along the way. We elicited help from educators, counselors, and health care professionals from St. Cloud, the Twin Cities, and Fargo. Jackson’s last setback was in early 2015 and since then, he had been doing very well without any indication of a problem. Jackson loved his family and friends dearly and we are all shocked by his passing. When I heard the news that my son had passed away, I told my close friend that I had lost hope. I had lost Jackson. At Jackson’s wake service, individuals shared with Reyne and I how Jackson helped them or helped their child in a time of need. Jackson made a difference for many in some way. I also found out Jackson had been attending church services with a friend prior to his passing. By others sharing their stories about Jackson I have realized that hope is not lost. I do have hope and we, God’s people, have hope. A Jackson Roeder Memorial Fund has been set up at Centracare Child & Adolescent Behavioral Health. Click here to make a donation. You can also purchase Jackson's artwork with all proceeds going to this fund. Click here to view Jackson's artwork. Jackson had a nickname around our house. We called him The Wind. So on windy days think of Jackson. Think of hope. North Dakota State University (NDSU) each spring has a memorial service for students who passed away the prior year. They also plant a tree for each student in an appropriate spot on campus. 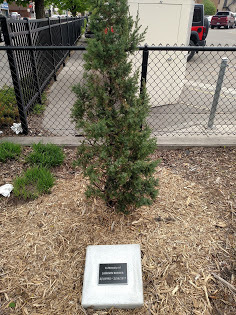 Jacksons tree is planted in front of the Renaissance (Architecture) building in downtown Fargo.